Join us for an exciting evening of all-time favorite songs and music at Theater on the Roof on Sunday November 4th! 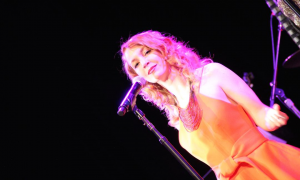 This concert will be a dynamic medley of Jewish songs, popular Russian motives, and jazz standards, performed by young and very talented professional singer, Marina Vinogradova (also known as Marina Ginger), a recent graduate of Berklee College of Music. Marina is accompanied on a keyboard by Leonid Shapiro, a 3rd generation musician and Yiddish performer, from Lithuania. Marina is a versatile performer whose repertoire, in addition to Jewish songs in Yiddish and Hebrew, includes such genres as jazz, funk, soul, gospel, and other. Not only is she a passionate performer with beautiful voice, strong presence and enchanting manner – Marina is also a band leader, conductor, arranger, and song-writer. Marina is a proud participant in several performing groups and prestigious shows in Massachusetts and in Moscow, a winner of multiple awards at a number of musical festivals, a vocal coach, and a judge at regional vocal competitions. Leonid comes from an multi-generation family of musicians, composers, singers and performers. His broad repertoire spans Yiddish songs (inherited from his mother who was acclaimed for performing songs in Yiddish), Klezmer music, jazz standards, and popular Russian songs. Leonid performed with several groups in Lithuania, Belorussia and St. Petersburgh, and later in Western Massachusetts. In 1998, joined by his family, Leonid organized Festival of Russian Songs and Music in Worcester, MA.